Dovecote behind Sunny Brae, Embleton. Photo Northumberland County Council, 1970. Embleton lies on the north Northumberland coast just north of Dunstanburgh Castle. The northern part of Embleton Bay lies within the parish and the rocks at the northern end of the bay have claimed several shipwrecks. The main settlements are Embleton, hidden from the sea by a whinstone bluff, and Christon Bank, as well as a number of farmsteads. The name Embleton may mean 'elm valley' or may be the hill where a man nicknamed the Caterpillar lived! Very little is known about the parish in prehistoric times. There have been no discoveries of such things as Neolithic stone tools or Bronze Age burials and most of our evidence of past human activity belongs to the medieval and later periods. However, a group of cropmark features on Embleton Moor includes some possible Bronze Age ring ditches and may be the earliest archaeological site in the parish. Although we have no evidence of an Iron Age or Roman presence in the parish the area probably changed very little during the period of Roman rule as Embleton lies well north of Hadrian's Wall, the northern edge of the Roman Empire for much of its time in Britain. Following the end of Roman rule in Britain in the early fifth century, we have to wait until after the Norman Conquest to find evidence of any settlement in the parish. The village of Embleton is known from medieval documents and dates back to at least the 13th century. A number of medieval buildings and establishments also stood in, or near the village, including a Moot Hall, a hospital and a church. However, these were also times of warfare and unrest in the borders of England and Scotland and because of this a tower house was built here. Embleton and the surrounding areas suffered many losses and much damage during this period. Perhaps the coins found in the churchyard were buried there to keep them safe. The post-medieval period saw the beginning of more peaceful times and was a relatively prosperous time for this region. A growing confidence meant that buildings such as the tower house were turned into less defensive country homes and, here, the building was turned into a vicarage. A number of new farms were built in the 18th and 19th centuries in response to new inventions and farming methods. Christon Bank is such a farm and has ranges of buildings around a series of yards. During this `Age of Improvement' lime was almost universally used as a fertilizer. 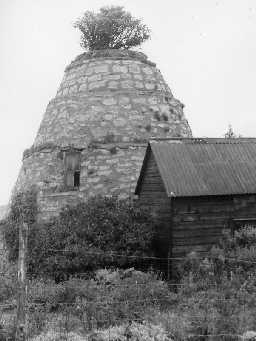 Quite often it would have been made and prepared on the farm in a kiln, but some enterprises developed commercially, such as at Christon Bank Quarry. A number of other industries developed alongside farming, including whinstone quarrying and breeding of doves. Doves were bred for meat and dovecotes, such as that at Sunny Brae, would have been prestigious buildings. The 19th century also saw the arrival of the railway, with the opening of the line from Newcastle to Berwick. More recently the parish prepared to defend itself from invasion during World War II with pillboxes built at Embleton and Chuck Bank on the coast. Today, Embleton is an attractive and convenient base for exploring the north Northumberland coast.